What's up with animals acting all crazy and stuff? We had spiders sabotaging Toyotas. Now, we got oarfish invading California. There was one found last week on Catalina Island. Now, another one has shown up. I don't know what they're up to, but those giant fish -- they can grow over 50 feet long -- have something in mind. And I think they're in cahoots with the alligators. 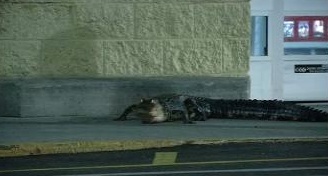 In Apopka, Florida, an alligator set up outside the door to a Walmart, scaring folks away. It left after a while, but it made its point: that Walmart is on its turf. So, what's up with the animals? Well, I checked The Revelation, and while there is some weird animal stuff in there, it's mostly seven heads, ten horns kinda things. No spiders, oarfish, or alligators though. But not as scary as the people that you find inside a Walmart. Maybe the alligators are on our side after all. But not as scary as Congress critters. Sure it wasn't just some Union organizer? Next time you really want to tick an oarfish off, remind it that it's also known as the King of Herrings (no lie). Extra points if you use a high pitched, shrieky Monty Python accent. walruskkkch had the same thought I did! "They were given power over a fourth of the earth to kill by sword, famine and plague, and by the wild beasts of the earth." Hmm... it may be later than I thought!